All Saints Day or All Hallows Day is a Catholic tradition honoring the saints and also deceased family members each November 1. All Saints Day, or la Toussaint in French Louisiana, is a Catholic holy day of obligation observed each November 1 in honor of saints, both famous and obscure. 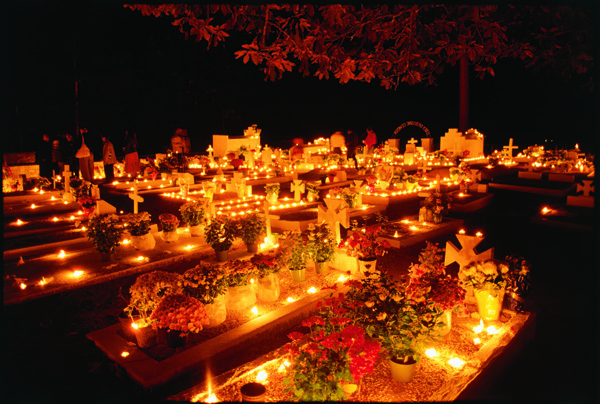 Also known within the Roman Catholic Church as the Solemnity of All Saints or All Hallows, this celebration has vernacular dimensions in much of the Catholic world from Europe to Mexico to Louisiana, as families gather in cemeteries to refurbish and beautify the graves of family and friends. 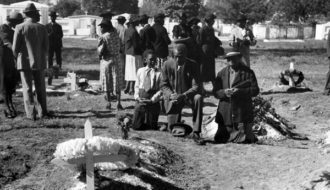 Burial culture in New Orleans and rural southern Louisiana, which is predominantly Catholic, has long intrigued outsiders. High water tables, particularly in the state’s coastal regions, require many undertakers to construct above-ground tombs in graveyards, but these brick and concrete structures can deteriorate in the region’s subtropical climate. Hence, All Saints Day has traditionally served both a practical and a social function. In the past, families repaired tombs and coated them with a mix of lime and water (whitewash) to seal the structure. They also cleared overgrowth and weeds and placed floral arrangements, or coronne de toussaints, on the graves to show their respect for the dead. In years past, women would make wreaths of crepe paper or waxed paper, known as immortelles or couronnes, and sell them at churches and cemeteries on All Saints Day, but that tradition waned as more durable plastic flowers came into vogue. In less-affluent communities, families simply painted wooden crosses to use as grave markers. Modern granite headstones have obviated the need for whitewashing, but some families continue the tradition of cleaning and decorating gravesites on November 1. All Saints Day remains a recognized state holiday in which Louisiana government offices and courts are closed. 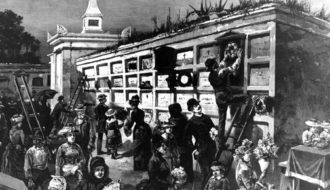 In the nineteenth and early twentieth centuries, cemeteries in New Orleans took on a festive air on All Saints Day as families would pack picnics and spend the day visiting among friends while decorating tombs, and vendors would conduct business selling food and flowers. The act of beautifying is also an act of continuity. Remembering loved ones not only keeps the memory of the deceased alive, but transmits family lore across generational lines. Children learn genealogy at the cemetery as their parents recount anecdotes about their ancestors. 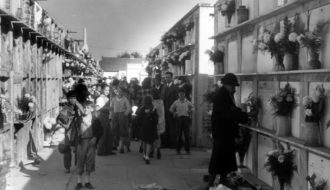 Participation in this tradition has waned in many places but remains significant in the St. Tammany Parish community of Lacombe, where French, Creole, and Choctaw cultures have influenced the custom. Even some Protestant families have adopted the tradition there. Typically, the pastor of Lacombe’s Catholic church will spend much of the afternoon every All Saints Day visiting and blessing the community’s many cemeteries, several of which are small and restricted to specific families. The practice concludes at or after sunset at Lafontaine Hilltop Cemetery, where graves are adorned with white candles. The faithful reverently light the candles at relatives’ graves, and the entire cemetery is cast in a picturesque, serene glow as the priest makes his way through the cemetery, offering prayers as he sprinkles the gravesites with holy water. While All Saints Day is observed by several religious denominations in the United States, including Lutherans and Episcopalians as well as Catholics, these practices at the burial places of family members are largely limited to New Orleans and the Acadiana region of South Louisiana. 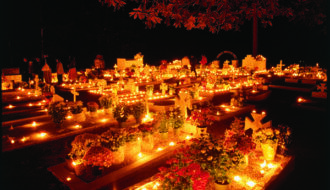 Another significant American custom on All Saints Day, though, can be found in Hispanic communities around the country, where residents pattern observances after the “Day of the Dead” celebrations of Mexico. Marked by family gatherings at cemeteries, fireworks, and public parades featuring flowers, wreaths, and effigies of skeletons, Dia de los Muertos is a two-day event memorializing deceased infants and children on November 1 and adults the next day. All Saints Day also is a public holiday in many countries of eastern Europe, where residents visit cemeteries to honor not only departed relatives and friends but also national heroes. 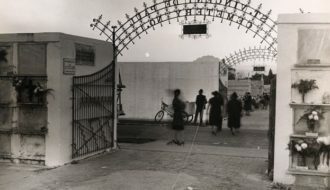 In some southeastern Louisiana parishes, priests used to conduct Mass in the cemetery before holding a candlelight vigil. As one resident remembered, a representative of each family “would put the candle on his [family’s] tomb and kneel down and the priest would bless the dead.” In 1985 folklorist Frank de Caro noted that in Lacombe, black and Creole communities enthusiastically continued the ritual of maintaining graves and lighting long white candles on la Toussaint. In general, however, the holy day of remembrance is moving into the realm of Cajun memory. "All Saints Day." In https://64parishes.org Encyclopedia of Louisiana, edited by David Johnson. Louisiana Endowment for the Humanities, 2010–. Article published November 1, 2016. https://64parishes.org/entry/all-saints-day. Ancelet, Barry Jean, Jay Dearborn Edwards, and Glen Pitre. Cajun Country. Jackson: University Press of Mississippi, 1991. Florence, Robert. 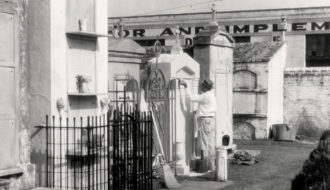 New Orleans Cemeteries: Life in the Cities of the Dead. New Orleans: Batture Press, 1997. Jordan, Rosan Augusta, and Frank de Caro. “Field Notes on All Saints’ Day, 1985 and 1986.” Louisiana Folklore Miscellany 12 (1997): 79–88. All Saints Day at St. Louis Cemetery in New Orleans.